I enjoy both of these very much. I think the bottom one is stronger because of the composition. The way the action is sequenced is very clear and its easy to rewind and play the image over and over again. It makes a strong image. I like what you are doing with the top image and you portray depth nicely, however, these two images don’t seem to fit together. While the second image reflects your statement that your images want to explore human emotion AND interaction, the interaction is lost in the first image. It does however give me a sense of anxiety and I think that is interesting. I really enjoy this idea; I think it’s working quite successfully in both photographs. It seems like you put a good amount of thought into how to accurately portray time in still images. By placing the images of the girl in the second photograph so close together, it conveys to the audience that it’s a quick, progressive action that happens within a matter of seconds. In contrast, one could assume from the inconsistent poses and space between the figure in the first image, that significant time has passed. However, in the first photo, I wish the arm wasn’t cropped out of the frame on the left side. Also, it might have been more successful if he stood on the right side of the wall instead so the viewer can clearly see him pushing the elevator button in the background; that one is my favorite pose! I think these have potential to be really successful. I especially love the bottom one. The sense of movement, action, and scene are really interesting. The top one seems a little cliche. 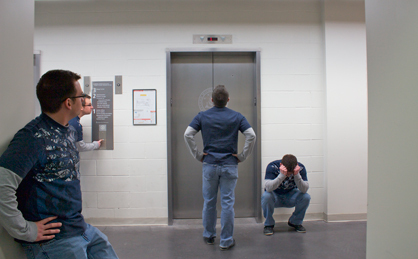 Though the focus on the elevator gives slight narrative, it isn’t as successful as the bottom one. I am interested to see the others fit together. I’d definitely stick with shoring movement and interaction rather than the attempted emotion on the top photo. I enjoy both images, and understand what you were trying to portray. I think you put good thought into the first photo when it came to the positioning of the model. I think you definitely got across impatience. I would suggest that you may wanted to zoom out a bit on the photo so you aren’t cropping the arm off of the closest subject, and also by doing that you could reposition the closest subject back a bit so it’s not covering the view of the guy pushing the button. The second image is a wonderful portrayal of a close succession of time. What I’m confused about is why she fell. I guess it just makes you think. I really enjoy both of these images but I will disagree with some of the other comments and say that I enjoy the top image, “Impatience” more. I don’t find it cliche and in fact feel more of the emotion and irritation that you are feeling, especially with the person staring right at the elevator doors and crouched down holding their head. The bottom one is fun and does show a movement, but again the top I feel the actual human emotion is better conveyed. Though some may think it is a bit cluttered on the right side, I think actually if you had even a few more copies of him pushing the elevator button, like just a big group with the faces getting more and more agitated. That would be interesting I think. I think I might have to do a series similar and work off of your idea! Awesome job! These are really interesting. I love the bottom one it really portrays a child very well and the top one is a great job of portraying the feeling of waiting. I find these to be very strong images. 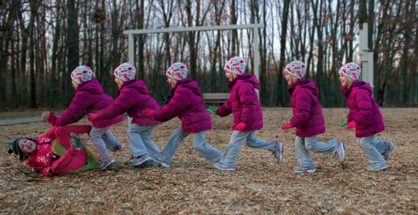 I love the idea of time progression to show a sense of motion and emotion in the photos. The editing makes these photos look absolutely seamless and I really enjoy the movement and interaction in the bottom photograph in particular. These are both very strong for different reasons, I feel like the first photograph focuses more on the emotion and frustration of the subject, whereas the second photograph focuses on the motion and breaking down the action into basic steps. I do agree with some comments that the composition could be better in the top photograph. The fact that the guy pressing the button is covered looks awkward, especially when there is plenty of room for him to be seen. I really like your choice to repeat the subject multiple times in your photos to show movement and emotion. I actually FEEL impatient and anxious when I look at that first photo. Your second photo is much more playful and exciting, and I can see a connection between you and the subject. When I look at your photos, I feel the emotions that you are depicting and I think that is what makes them so successful. Really like your composition of both pictures. The movement of the subjects shown as the repetition of their presence in the photograph brings out the content of your work. This work of progressive photography is really interesting and compelling. I really like that you were able to represent different emotions in the two pictures.